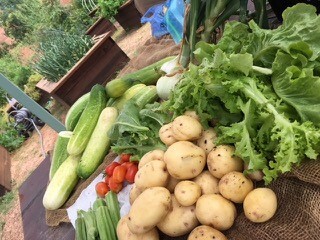 Organic and truly local freshly harvested potatoes, onions, tomatoes, squash, okra, cucumbers, cut flowers and some herbs will be available for donation in Anderson Common after the Sunday, July 8 Sanctuary service. This produce is from The Stewpot’s Garden Club. Encore Park Community Garden (EPCG) and The Stewpot host a weekly Garden Club program where Stewpot clients grow produce in their own EPCG plots. A horticultural therapist leads this group with the goal to build community, reinforce healthy behaviors (for people and plants) and participate in fun activities. The Garden Club’s first priority is for Stewpot clients to enjoy eating their produce but occasionally there is more than they can consume but not large enough quantities to donate to The Bridge. This spring the Community Ministries Committee and the Session approved allowing members of The Stewpot Garden Club and the EPCG committee to make excess produce available for donation on select Sunday mornings.